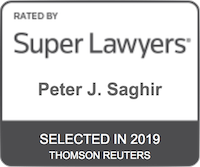 Hired out of law school, Peter Saghir has spent his legal career with Gair Gair Conason fighting for justice for those who have been killed or seriously injured through the fault of others. Peter has honed his trial skills under the tutelage of the firm’s senior partners and has been a fierce advocate for his clients. 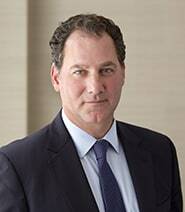 He has achieved numerous multi-million dollar settlements and verdicts and has been recognized as a Super Lawyer in the New York Metro area since 2016. In addition, as a result of Peter’s success as a trial attorney, he has been asked to lecture and teach by various organizations, including the New York State Trial Lawyers’ Association, the National Institute of Trial Advocacy, Cardozo Law School and Hofstra University. 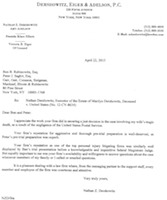 Peter has tried and co-tried numerous cases which have resulted in highly favorable verdicts including a $41.5 million verdict for the family of a New York City sanitation worker who was fatally run over by a street sweeper, and a $27.5 million verdict against the New York City Transit Authority in a case involving a pedestrian whose leg was amputated above the knee after she was struck and run over by a bus. He also prepared and co-tried a complex case against the City of New York and a construction company in which it was claimed the defendants negligently failed to warn traffic on the West Side Highway of a construction site in the roadway. This failure to warn resulted in catastrophic injuries to the plaintiff whom the defendants claimed was solely responsible for his accident. Following a lengthy and hotly contested trial, a Manhattan jury found the plaintiff completely free from fault and awarded him $7,125,000. Peter prides himself on meticulously preparing every case for trial to ensure a successful verdict or, if appropriate, settlement. In September 2018, Peter obtained a record setting settlement of $27,500,000 against the Diocese of Brooklyn on behalf of four young boys who were sexually assaulted by a volunteer in a local Brooklyn church. The settlement, which was split equally among the four boys, is the largest settlement amount paid by the Catholic Church in the United States to one individual. $27.5 million record setting settlement on behalf of four young boys who were sexually abused by a worker in a local catholic church in Brooklyn. Each of the four boys received $6,875,000 which is the largest settlement amount paid by the Catholic Church to one person. $41.5 million verdict on behalf of a sanitation worker who was killed by a street sweeper in a New York City sanitation garage. The decedent left behind his wife and four young children. $27,500,000 verdict for a pedestrian struck by a New York City Transit Authority bus making a right turn in Manhattan. The 45 year old plaintiff, who was married with three children, suffered a near traumatic amputation of her leg at the scene. Ultimately, her leg was surgically amputated. The jury found that the Transit Authority was 100% at fault for the happening of the crash. $8,570,000 verdict for a bicyclist who was side swiped by a New York City Transit bus as she rode south along Union Square. The bicyclist suffered degloving injuries to one leg and required multiple skin grafts. After a 7 week trial, the jury determined that the bus driver and Transit Authority bore the majority of fault and returned a multi-million dollar verdict. $4,946,548.15 verdict on behalf of a 68 year old bicyclist who was struck and killed by a postal truck. The case proceeded to trial in Federal Court against the US Government where the postal driver was found 100% at fault for the happening of the crash. $7,125,000 verdict for a 41 year old man injured in a car crash. The plaintiff, who suffered knee injuries requiring multiple surgeries, brought suit against the City of New York and a construction company working on the roadway for failing to provide appropriate warnings to motorists that the West Side Highway was being shut down. $6,500,000 settlement on behalf of an 80 year old woman who was struck by a bus as she attempted to board. The woman suffered crush injuries to both feet and underwent numerous surgeries. $3,250,000 settlement on behalf of a 27 year old pedestrian who was struck by a right turning truck. The plaintiff suffered a pelvic ring fracture requiring external fixation and subsequent internal fixation of the pelvic fractures. $3,000,000 settlement during trial for a motorcyclist struck by a New York City sanitation truck making a left turn. The motorcyclist suffered knee and lower back in-juries requiring surgery. $2,350,000 settlement on behalf of a 79 year old pedestrian crossing against the light who was struck and killed by a motorist. Following the crash the plaintiff was admitted to the hospital but ultimately succumbed to his injuries. It was claimed that despite the plaintiff crossing against the light he was there to be seen by the motorist who admitted she never saw him. $1,900,000 settlement on behalf of a 67 year old man who was injured in a boating accident. At the time of the crash the plaintiff was seated next to the driver when the boat struck a submerged island and the plaintiff was propelled forward striking his head on the windshield. He suffered a herniated disc in his neck which required surgery. $1,300,000 settlement on behalf of a 64 year old motorcyclist who was struck by a left turning car. The motorcyclist suffered tibial plateau and clavical fractures requiring surgery. $450,000 verdict on behalf of a 28 year old pedestrian who suffered three meta-tarsal fractures when two workers dropped a plate glass window on her foot. The highest offer on the case was $250,000. The offer was rejected, and the case proceeded to trial where the jury unanimously found the defendants at fault for the happening of the accident. $125,000 verdict on behalf of a 19 year old woman who was struck by a car and suffered a fracture to her foot and clavicle without needing surgery. The defend-ants argued that she was running across the street outside the crosswalk at the time of the crash. The jury returned a unanimous verdict finding the driver completely at fault for the happening of the crash. The trial was birfucated and settled after liability. The auto policy was limited to $100,000 but the driver made a substantial personal contribution which is being paid over a term. 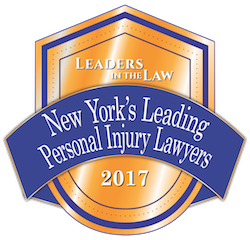 Peter assists Ben B. Rubinowitz in writing the “Trial Advocacy” column in the New York Law Journal. Highly recommended by reputation: THE DREAM TEAM, professionals taking you out of your NIGHTMARE. You helped us every “knot” of the way! Your proficiency, knowledge, along with the research of the massapequa waters, boating safety proved the recklessness of the driver; who didn’t protect us from danger. Peter, during the deposition your questions/extrapolating the facts of defendant of prior accidents , lawsuits and what occurred the night of the boating accident were remarkable. You took such a personal approach, understanding our situation with care and warmth for due diligence. Our future was in your hands since our friend was reckless in ours. You provided the negotiator with cases you researched that awarded larger sums.